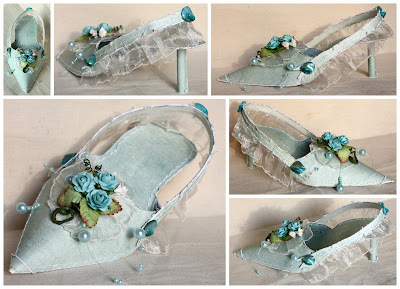 My new project - a shoe - is made for A Vintage Affair April challenge. I just found it sooooo interesting and soooooo challenging! I've never made any decorative shoes, he he... The sketch you may find at Artful Afirmations blog. Hi Loriete - I thought these were a REAL pair of shoes lol!! !I want them - they are so beautifully made with gorgeous decoration! Kaip grazu!!! Uzsimaniau pabut karalaite :-)))) Nepakartojamas batelis! Na, tu cia mane pritrenkei. :) Nesugalvociau net nuo kurio galo toki bateli gamint pradet. ohhhhhhhhh -- these look so Cinderella shoes, they are so beautiful!